Now, now Terrell. 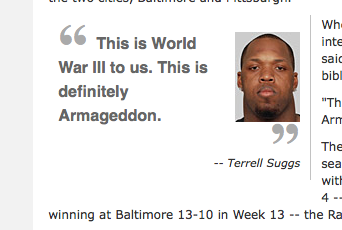 Let’s save words like “Armageddon” for things that really warrant the comparison. Like thousands of birds dropping dead from the sky. Or hundreds of thousands of fish mysteriously floating dead to the river surface. 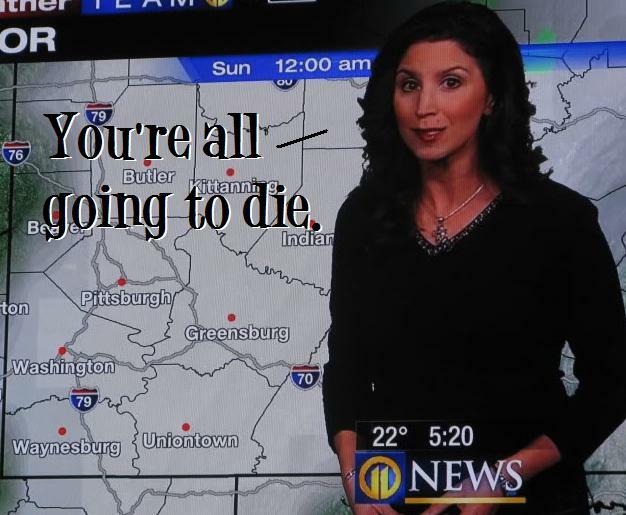 Or, you know, three to five inches of snow in Pittsburgh during afternoon rush. I was told by a friend that the birds falling out of the sky should be called the “A-flock-alypse”… This maybe something you hope happens to pigeons? Can we send Mr. Suggs to Kandahar for just five, 10 minutes? See if he starts sobbing like a little girl. bucdaddy….I’d gladly exchange suggs for my bro-in-law, who is currently seeing what the hell armageddon really looks like in kandahar….